Donald Trump has a simple formula to get America's energy industry back on its feet: regulate less and start drilling a lot more for oil and gas. In his first in-depth speech about energy policy, Trump on Thursday promised to make American energy "dominance" a strategic economic and foreign policy goal of the U.S.
"America's incredible energy potential remains untapped. It's a wound that is totally self-inflected," Trump said during a speech at a North Dakota oil industry conference. Trump, who earlier in the day had secured enough delegates to clinch the GOP nomination, warned that Democratic rival Hillary Clinton will make life tougher for the energy industry. "This is your treasure and you the American people are entitled to share in the riches," Trump said. The event was live-streamed by ValleyNewsLife.com, the NBC and CBS affiliate for Fargo, N.D.
At least in the short term, Trump's plan would be unlikely to solve all of the energy industry's problems. Oil prices crashed as much as 75% over the past two years because of a supply glut caused by too much U.S. drilling, not by overregulation. The same is true with natural gas, which remains at depressed prices. Pumping a lot more oil could make the U.S. less reliant on foreign oil, but it may also renew the oversupply problem that only recently has started to recede. America first: Trump promised that the U.S. will achieve "complete" independence from foreign sources of oil. "Imagine a world in which our foes and the oil cartels can no longer use energy as a weapon. Wouldn't that be nice?" Trump said, adding that the U.S. is "loaded" in oil and gas resources. A key Trump adviser, Rep. Kevin Cramer of North Dakota, has co-sponsored a bill that would create a commission to investigate whether OPEC is manipulating oil prices through anti-competitive behavior. Regulate less: Trump said any regulation that is "outdated, unnecessary, bad for workers" or deemed "contrary to the national interests" will be scrapped completely. And here's Trump's criteria for future restrictions: "Is this regulation good for the American worker?" Trump also promised to make policy decisions in a public way and very transparently, adding they won't be "made on Hillary Clinton's private email account." Trump said he'd approve Keystone XL, which was blocked by President Obama. However, Trump would do it differently. He wants a cut of the profits because the controversial pipeline from Canada wouldn't be possible without U.S. approval. Pump more: Trump proposed lifting existing moratoriums on oil and gas production on federal lands. Trump also wants to revoke policies that oppose unwanted restrictions on new technologies used for drilling. "We're loaded and we didn't even know it," Trump said, alluding to the fracking revolution that has unlocked oil and gas production. It's the exact opposite approach of Bernie Sanders, who wants to ban fracking for oil and gas entirely due to concerns it encourages a reliance on fossil fuels and is bad for the environment. Green activists not welcome: Trump said he would work with conservationists whose only goal is to protect nature. He said his priorities are "clean air and clean water." However, he said in a Trump administration "political activists with agendas will no longer write the rules." Create and save jobs: Trump said his energy plan will create "lots of jobs." Workers in the oil industry are struggling these days as a result of countless job cuts caused by the crash in oil prices. Trump even promised to "save" the coal industry -- a sector of the economy that has been crushed by market forces and tough regulation. 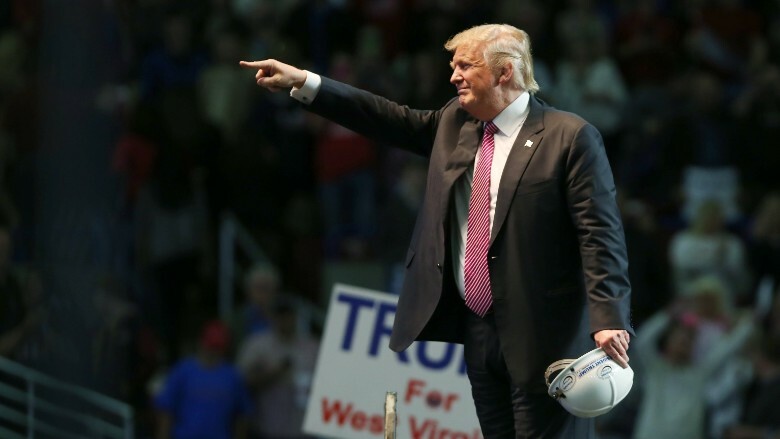 "President Obama has done everything he can to kill the coal industry...just ask the people of West Virginia," Trump said. Not picking winners and losers: Trump said his energy plan would include nuclear power as well as renewables like wind and solar. However, he said he wouldn't exclude fossil fuels that are working now. "The government should not pick winners and losers, instead it should remove obstacles to exploration," Trump said. Rebuilding America's infrastructure: Trump thinks his energy plan could create $6 trillion in additional tax revenue over the next four decades. He said that extra money should be pumped back into the U.S. by repairing "crumbling" roads, bridges and schools.